﻿ What is Islam and the Islamic World? WHAT IS ISLAM AND THE ISLAMIC WORLD ? Islam (/ˈɪslɑːm/;[note 1] Arabic: الإسلام‎, al-ʾIslām IPA: [alʔisˈlaːm] ( listen)[note 2]) is a monotheistic and Abrahamic religion articulated by the Qur'an, a religious text considered by its adherents to be the verbatim word of God (Allāh), and, for the vast majority of adherents, by the teachings and normative example (called the sunnah, composed of accounts called hadith) of Muhammad (c. 570–8 June 632 CE), considered by most of them to be the last prophet of God. An adherent of Islam is called a Muslim (sometimes spelled "Moslem"). Muslims believe that God is one and incomparable and that the purpose of existence is to worship God. Islam began in the early-7th century. Originating in Mecca, it quickly spread in the Arabian peninsula and by the 8th century the Islamic empire was extended from Iberia in the west to the Indus river in the east. The Islamic Golden Age refers to the period traditionally dated from the 8th century to the 13th century when much of the historically Islamic world was experiencing a scientific, economic and cultural flourishing. The expansion of the Muslim world involved various caliphates and empires, traders and conversion to Islam by missionary activities. Most Muslims are of two denominations Sunni (75–90%) or Shia (10–20%). About 13% of Muslims live in Indonesia, the largest Muslim-majority country, 32% in South Asia, 20% in the Middle East, and 15% in Sub-Saharan Africa. Sizable Muslim communities are also found in Europe, China, Russia, and the Americas. Converts and immigrant communities are found in almost every part of the world. With about 1.6 billion followers or 23% of the global population, Islam is the second-largest religion by number of adherents and, according to many sources, the fastest-growing major religion in the world. (2) WHAT IS THE MUSLIM/ISLAMIC WORLD? The term Muslim world, also known as Islamic world and the Ummah (Arabic: أمة‎, meaning "nation" or "community" has different meanings. In a religious sense, the Islamic Ummah refers to those who adhere to the teachings of Islam, referred to as Muslims. In a cultural sense, the Muslim Ummah refers to Islamic civilization, exclusive of non-Muslims living in that civilization. In a modern geopolitical sense, the term "Islamic Nation" usually refers collectively to Muslim-majority countries, states, districts, or towns. Although Islamic lifestyles emphasise unity and defence of fellow Muslims, schools and branches (see Shia–Sunni relations, for example) exist. In the past both Pan-Islamism and nationalist currents have influenced the status of the Greater Middle East. Clashes between Islam's two big sects, the Sunni and the Shia, take place across the Muslim world. In the Middle East a potent mix of religion and politics has sharpened the divide between Iran’s Shia government and the Gulf states, which have Sunni governments. Last year a report by the Pew Research Centre, a think tank, found 40% of Sunnis do not consider Shia to be proper Muslims. So what exactly divides Sunni and Shia Islam and how deep does the rift go? Today the world’s 1.6 billion Muslims all agree that Allah is the only God and Muhammad his messenger. They follow five ritualistic pillars of Islam, including Ramadan, the month of fasting, and share a holy book, the Koran. But while Sunnis rely heavily on the practice of the Prophet and his teachings (the “sunna”), the Shia see their ayatollahs as reflections of God on earth. This has led Sunnis to accuse Shia of heresy, while Shia point out that Sunni dogmatism has led to extremist sects such as the puritanical Wahhabis. Most Shia sects place importance on the belief that the twelfth and final imam is hidden (called "in occultation") and will reappear one day to fulfill divine will. Meanwhile, their sense of marginalisation and oppression has led to mourning ceremonies such as ashura, when followers flagellate themselves to commemorate Hussein’s death at Karbala. There has never been a clash between the Shia and Sunni on the scale of the Thirty Years War, which saw Christian sects fight each other in 17th-century Europe with great loss of life. This is partly because the Shias, ever mindful of their minority status, retreated. The lines that divide Muslims in the Middle East today are being drawn by politics as much as by religion. The "Shia Crescent" that runs from Iran, through Mr Assad’s regime in Damascus to Hizbullah in Lebanon was once praised by Sunni figures. But the revolutions in the region have pitted Shia governments against Sunni Gulf states such as Saudi Arabia and Qatar, who have supported their co-religionists with cash. This is strengthening Sunni assertiveness and making the Shia feel more threatened than usual. In most cases, though, members of the two sects still live harmoniously together. Tensions between Saudi Arabia and Iran fundamentally boil down to two things – the battle to be the dominant nation in the Middle East and the fact the countries represent the regional strongholds of two rival branches of Islam. The Kingdom of Saudi Arabia is ruled by a Sunni monarchy known as the House of Saud, with 90 per cent of the population adherents of their leaders’ faith. The Islamic Republic of Iran, meanwhile, is overwhelmingly Shia, with up to 95 per cent of nationals belonging to the denomination. Both countries are major oil producers but while Saudi covers a significantly larger land mass, Iran’s population is more than twice the size. It is the theological divide that really drives the wedge between the two countries, however, with each unable to accept the legitimacy of the other nation’s dominant faith. WHAT CAUSED THE SUNNI-SHIA DIVIDE? The Sunni-Shia conflict is 1,400 years in the making, dating back to the years immediately after the Prophet Mohammed’s death in 632. The Prophet died without having appointed a successor leading to a massive split over the future of the rapidly growing religion – chiefly whether the religion’s next leader should be chosen by a kind of democratic consensus, or whether only Mohammed’s blood relations should reign. The arguments are complicated but essentially boil down to the fact that Sunni’s believe the Prophets’ trusted friend and advisor Abu Bakr was the first rightful leader of Muslims or “caliph”, while Shias believe that Mohammed’s cousin and son-in-law Ali was chosen by Allah to hold the title. Both men did eventually hold the title – Abu Bakr first until his death, and Ali fourth after two previous caliphs were assassinated – but the schism really hit over who should come next. While Sunni Muslims argue that their interpretation of Islam follows the Sunnah (ways of Mohammed), Shias argue that Ali was the rightful first caliph and only his descendants could claim to be the true leaders of Muslims. The tension is not eased by a Hadith in which the Prophet was quoted as saying: “My Ummah (community) will be fragmented into seventy-three sects and all of them will be in the Hell fire except one.” Inevitably both Sunnis and Shias claim to be the one “pure” Islamic sect. WHAT DOES EACH GROUP BELIEVE? As with any division that lasts over a thousand years, the Sunni-Shia split led to each denomination developing its own unique cultures, doctrines and schools of thought. While followers of either group range from the moderate to the extremist, Sunnis are largely focussed on the power of the God in the physical world, while Shias look more towards the rewards of the afterlife and as such place significant value in the celebration of martyrdom. WHAT IS THE GEOGRAPHICAL SPLIT OF SUNNIS AND SHIAS? 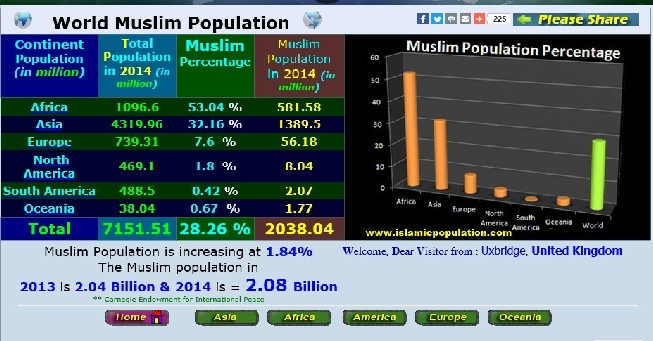 The vast majority of the Muslims in the world are Sunni, amounting to as much as 85% of the religion’s adherents. They are spread all over the globe – from Morocco to Indonesia - and make up the dominant religion in North Africa and the Middle East. Despite being members of the religious minority, the Saudi-backed Kingdom of Bahrain has long been ruled by the Sunni House of Khalifa. Equally Iraq was ruled by the Sunni Saddam Hussein for more than 20 years, during which time he brutally oppressed Shia Muslims. The current conflict in Iraq is fuelled by sectarian rivalries too, which embattled President Bashar al-Assad and his family members of the Shia Alawite-sect, while many of the insurgent groups in his country – including the Islamic State terror group – are Sunni adherents. And of course the current civil war in Yemen has become a sectarian proxy war, with Iran backing the Shia Houthi rebels who overthrew the country’s Sunni-dominated government, while a Saudi-led coalition has since intervened to reinstall the Sunni leadership. The differences between Alawites and Sunnis in Syria have sharpened dangerously since the beginning of the uprising against President Bashar al-Assad, whose family is Alawite. The reason for tension is primarily political, rather than religious: top positions in Assad’s army are held by Alawite officers, while most rebels from the Free Syrian Army are from Syria’s Sunni majority. Geographical Presence: Alawites are a Muslim minority group that accounts for around 12% of Syria’s population, with a few small pockets in Lebanon and Turkey (though not to be confused with Alevis, a Turkish Muslim minority). Around 70% of Syrians belongs to Sunni Islam, as does almost 90% of all Muslims in the world). Historical Alawite heartlands lie in the mountainous hinterland of Syria’s Mediterranean coast in the country’s west, next to the coastal city of Latakia. Alawites form the majority in Latakia province, although the city itself is mixed between Sunnis, Alawites and Christians. Alawites also have a sizeable presence in the central province of Homs and in the capital Damascus. Doctrinal Differences: Alawites practice a unique but little known form of Islam that dates back to the 9th and 10th century. Its secretive nature is an outcome of centuries of isolation from the mainstream society and periodical persecution by the Sunni majority. Sunnis believe that succession to prophet Mohammed (d. 632) rightly followed through the line of his most able and pious companions. Alawites follow the Shiite interpretation, claiming that succession should have been based on bloodlines. According to Shiite Islam, Mohammed’s only true heir, imam, was his son-in-law Ali bin Abu Talib. But Alawites take a step further in the veneration of Imam Ali, allegedly investing him with divine attributes. Other specific elements such as the belief in divine incarnation, permissibility of alcohol, celebration of Christmas and the Zoroastrian new year makes Alawite Islam highly suspect in the eyes of many orthodox Sunnis and Shiites. Ahmadiyya adherents believe that God sent Ghulam Ahmad, in the likeness of Jesus, to end religious wars, condemn bloodshed and reinstitute morality, justice and peace. They believe that he divested Islam of fanatical beliefs and practices by championing what is in their view, Islam’s true and essential teachings as practised by Muhammad. The Ahmadiyya Community is the larger community of the two arising from the Ahmadiyya movement and is guided by the Khalifa (Caliph), currently Khalifatul Masih V, who is the spiritual leader of Ahmadis and the successor to Mirza Ghulam Ahmad. He is called the Khalifatul Masih(successor of the Messiah). . They are either kafirs, who are deniers of God, or mushrak, putting gods next to God, or enervators, that's the lightest one. The enervators of religion who are they call the Sunni Muslims who ... for instance, celebrate Prophet Mohammed's birthday, and do some stuff that is not accepted by Salafis. What is your name? A quick look at an Iraqi's national identity card or passport can be a signal. Shias believe that the leadership of Islam was passed down through the Prophet Muhammad's son-in-law Ali and his sons Hussain (or Hussein), Hassan and Abbas, among others. While some Sunnis and members of other Islamic groups may also have those names, ISIS would most likely associate them with the Shias. Where do you live? In every city and province, even majority Sunni ones, there are enclaves that are known to be Shia. People who said they came from one of those neighborhoods would most likely be killed. How do you pray? Shias and Sunnis offer prayers in slightly different ways, with Sunnis generally folding their hands or crossing their arms in front of their stomachs and Shias leaving them extended, palms resting on their thighs. What kind of music do you listen to? Recordings of religious songs could also be a tipoff. Similarly, even the ringtone on a person's telephone could be a clue because it might be from a Sunni or Shia religious song.